Spend a fun and fascinating evening socializing and learning about Philadelphia’s dark side on this pub crawl. Your guide will entertain you with stories of the prohibition days and gangsters such as Al Capone and Leo Lanzetti on this tour that takes you to at least three local taverns. Savor a free beer, shot and snack; take advantage of drink specials; and answer trivia questions to win more free beer. This tour is the perfect way to learn more about Philadelphia while enjoying a relaxing night out meeting new people! Your pub crawl begins at Independence Visitor Center where you can make your way to the pubs to access exclusive drink specials. Once everyone’s settled, you’ll receive your complimentary beer, shot and snack. Relax with your food and drink and get to know the rest of your group, while your knowledgeable guide periodically regales you with spooky and scandalous tales from Philadelphia’s history. After a couple of hours, hit the streets and walk to two more historic taverns. At each bar, you’ll be eligible for drink specials and have time to mix and mingle with your group as your guide shares more anecdotes about Philadelphia’s past. Learn about the Prohibition gangsters including Al Capone, Mickey Duffy, Waxey Gordon and Leo Lanzetti who fought to control the city’s liquor trade. 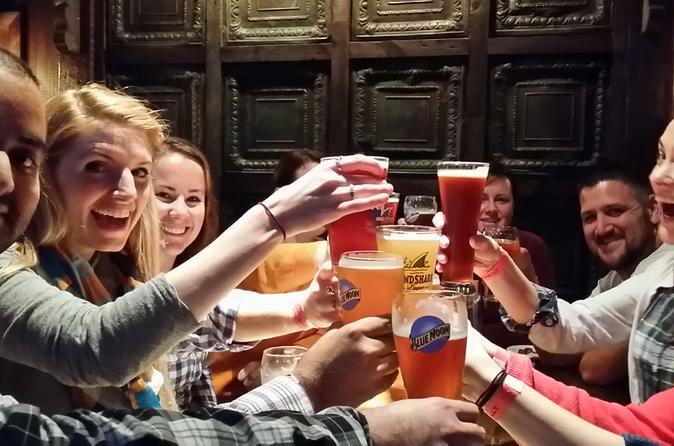 Throughout your tour, your guide will also lead icebreakers and drinking games. Plus, you’ll have the chance to answer trivia questions and win free drinks! Your historic and haunted pub crawl includes about 8 blocks of walking and wraps up at JJ Bootleggers Moonshine Bar. From there, it’s easy to keep exploring the city’s nightlife with your new friends!